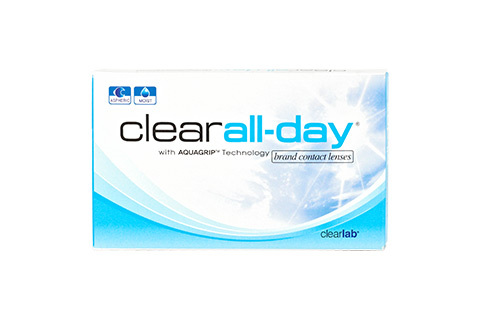 Clearall-Day® is the biocompatible range of monthly lenses from Clearlab. The new material ClearGMA contains the material mucin, which is made by the body itself, and which is also used to regulate the moisture levels in the human body. Clearall-Day® contact lenses are therefore ideally suited for people with dry and sensitive eyes. In tests with comparable monthly lenses, Clearall-Day® contact lenses have been shown to offer superior levels of tolerability. The aspherical design of Clearall-Day® contact lenses, informed by the latest research in lens design, does not just correct mild astigmatism - rather it significantly improves contrast and sharpness of vision in poor lighting conditions. Furthermore, aberration errors are minimised with Clearall-Day® monthly lenses. Shapes and texts can be viewed exceptionally clear. Plus, the smooth structure to the contour edge prevents stability problems caused by blinking. Clea rall-Day® contact lenses also offer great levels of comfort for the eye, even when worn for long periods. This is due to the high oxygen permeability levels and the extremely smooth surface of the biocompatible material, which helps to keep the formation of protein and lipid deposits to a minimum. In addition, ClearGMA is extremely good at retaining moisture, which in turn prevents the eyes from drying out. Don't miss out on the bundle offers available when you order your Clearall-Day® monthly lenses at the Mister Spex online store. Mister Spex advises all online purchasers of Clearall-Day® contact lenses: the contact lenses, Clearall-Day®, should always be fitted to your eyes by an eye doctor or optician. Unless expressly advised, you should visit your eye doctor or optician at least once every 6 months. You should have your eyes checked regularly. You should always adhere to the length of time that Clearlab/your eye doctor/optician's recommended as a wearing time for Clearall-Day® contact lenses and follow them strictly. It is your own personal responsibility to make yourself aware of the care instructions for Clearall-Day® contact lenses and to follow them accordingly. In case of eye irritation or visual impairments caused by Clearall-Day® contact lenses, remove the contact lenses immediately and consult an eye doctor or optician. Damaged contact lenses should be replaced immediately.